Series resonant circuit is used in high frequency power supply, which has the advantages of high power factor, less harmonic distortion, easy starting and low failure rate. Using Siemens (Infineon IGBT) as Inverter，The use of digital phase synchronization technology can always ensure that the IGBT works in the ZCS switch state，It increases the service life and stability of IGBT and reduces the loss of equipment. The main circuit of the equipment consists of rectifier circuit, chopper circuit, inverter circuit, straightening capacitor, transformer, resonant capacitor and induction heating coil.When working, the power frequency AC power supply is rectified by rectifying circuit to DC and then adjusted by chopper circuit from inverter circuit to suitable alternating current. Using the electromagnetic induction principle, alternating current is used to generate eddy current inside the heated material (that is, the heated workpiece), and the work piece is heated by the energy of these eddy currents.Induction coil is not in direct contact with the heated workpiece. The inductive coil transfers the electrical energy of the equipment to the heated workpiece through the magnetic field, and the electric energy changes into heat energy inside the workpiece. The machine tool is in the form of automatic line. 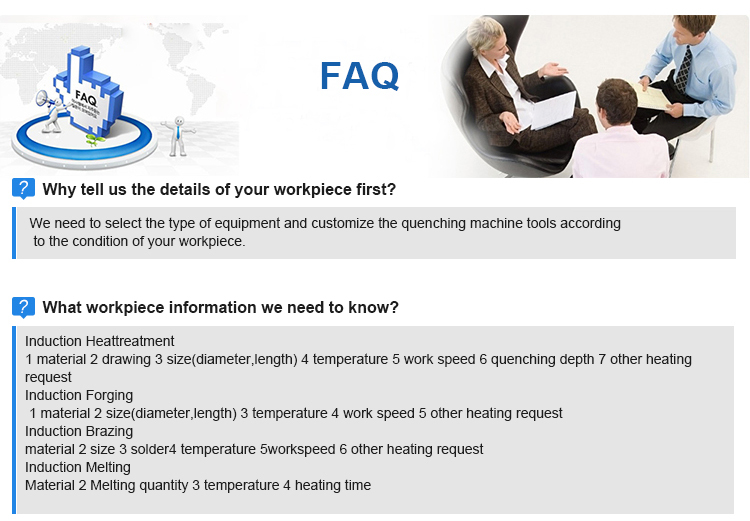 There are three workstations on the automatic line, including a feeding station, a heating station and a unloading station.This machine tool is designed for bullet case annealing.The electric system of the whole machine adopts the high-precision programming technology to realize the automatic control of the working program.The system can store the annealing process program of many kinds of workpiece. 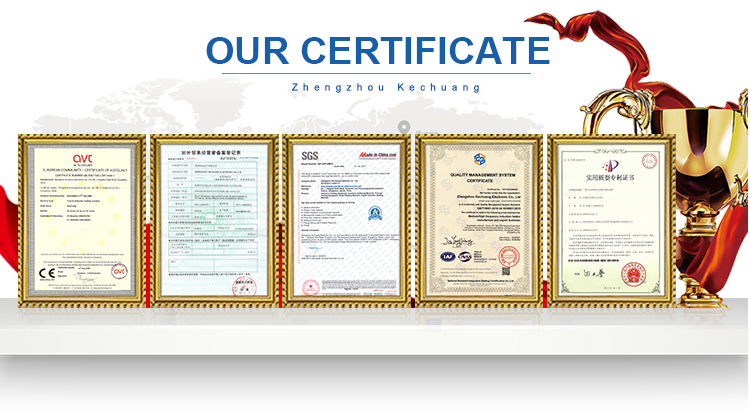 The machine tool has the function of manual operation and automatic operation. It is suitable for batch and single part production, and the debugging is quick and convenient.Advanced and reliable structure, excellent performance, stable operation and long design life. The machine tool consists of bed, feeding part, discharging part, moving air claw mechanism, workpiece rotating lifting part, inductor dual position conversion and adjusting part, water spray and water collecting tank and other stainless steel pipe, control and electrical appliances. Different from conventional mechanical transmission or hydraulic transmission, this machine tool is mainly designed for bullet case annealing.Because of its high positioning precision, the heating position of the workpiece can be set according to the different technological requirements of the workpiece when the workpiece is annealed by numerical control programming, and the continuous automatic annealing of the workpiece can be completed by adjusting the heating speed or heating temperature. The rotation speed of the workpiece is regulated by frequency conversion. Air-cooled part: working fluid (soft water or other liquids) circulating in the coil of a closed cooling tower. 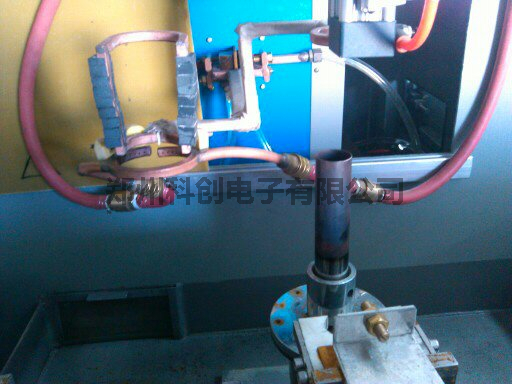 The heat of the fluid is absorbed by the tube wall of the coil, and the heat of the tube wall is discharged from the machine through the fan at the top. Water cooling part: when the temperature of the fluid is too high (over the set temperature) the sprinkler system is automatically started. The spray pump sprinkled water on the wall of the hot and humid tube and formed a water film, which absorbed a large amount of heat by evaporation (evaporation latent heat).Part of the spray water becomes steam, carried away by the flowing air, and the unevaporated water droplets fall in the sink for the next cycle.Closed circulation of fluid in coils, without theoretical consumption.The consumption of spray water is only 0.1-0.2% of the unit flow rate. 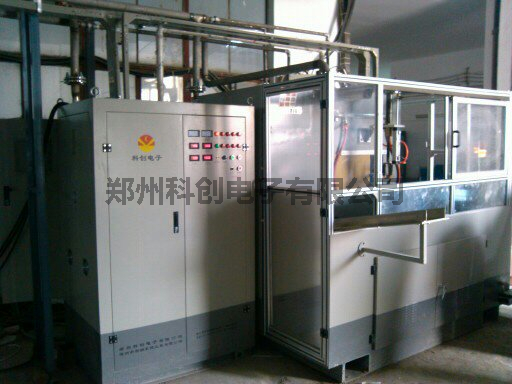 Main engine: the main cooling tower consists of shell, copper cooler, exhaust system, spray system, dehydrator, sink and so on. Auxiliary machine: auxiliary machine is mainly a cooling tower control system, composed of water pump, stainless steel water tank, temperature control system.